« Stop Making Assumptions. 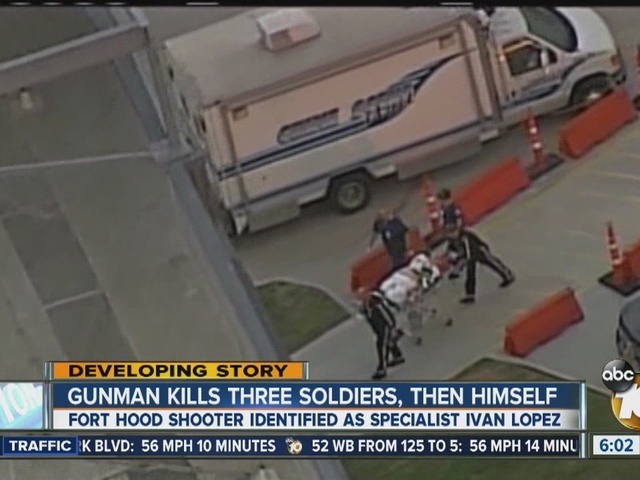 The Fort Hood Shooter was NOT a combat vet with PTSD. I need to address a persistent myth. I’ve seen this myth written in editorials and heard a well-known news commentator repeat it. I’ve had friends repeat it to me during polite conversations. This myth is blatantly ridiculous. Numerous news articles about the debate surrounding this myth have been published in the last few days. These articles show that this myth is…wait for it…a myth. Yet many people still cling to it. So I’m going to try to kill this myth. It’s not going to work, but I’m going to try it anyway. Myth: soldiers on military bases in America carry loaded weapons all the time. Reality: SOLDIERS ON MILITARY BASES IN AMERICA DO NOT WALK AROUND EVERYWHERE WITH LOADED WEAPONS. This myth leads some people to an objectively wrong conclusion. They believe that despite all those armed soldiers everywhere on Fort Hood, Nidal Hasan and Ivan Lopez couldn’t be stopped. Gosh darn it, they were just so powerful and terrifying, resistance was futile. They consider the Fort Hood shootings proof that not even highly trained and armed soldiers, much less armed citizens, can stop an active shooter. Thursday night I had a long conversation about gun control with a very intelligent, well-educated, liberal friend of mine. The discussion turned to Fort Hood. My friend, who is not an unreasonable man, thought soldiers “keep their issued weapons in their desks or something”. Friday the LA Times editorialist posted a halfhearted retraction, wherein he admitted he was wrong (but then claimed his point was that Fort Hood was heavily guarded but the shooting still happened, so there’s still no point in trying to defend yourself). Morgan was fired, although we don’t know if he ever learned how wrong he was about military bases. My friend’s incorrect belief was quickly corrected. But what about the rest of the country? Not all of it, but the part that says, “Having a gun doesn’t help. All those soldiers had guns, but they couldn’t protect themselves. They had to wait for the police to save them.” They’re wrong, but they don’t know it. They don’t want to know it. So I’m writing this for them. Please spread the word. Soldiers can’t carry weapons everywhere on post. Their issue weapons are only removed from the arms room for training. If the soldiers are going to fire those weapons, the ammunition is taken directly from the ammo storage facility to the range, and whatever isn’t fired is taken back to storage. Soldiers don’t carry issued weapons and ammo everywhere on post. And soldiers can’t carry personally owned weapons on post either. They have to be registered and secured. If a soldier has a concealed carry permit and legally carries off post, he still can’t carry on post. The only people authorized to carry weapons on post are Military Police and Department of Defense Police. MPs have to turn in their weapons at the end of their shift. They don’t take their weapons home like civilian police do. Do you get it yet? Military bases are “Gun Free Zones” (which don’t really exist, since the only way to enforce a Gun Free Zone is to have guys with guns search everyone). The strange, twisted ideas you have about masses of highly trained, experienced and ARMED soldiers being totally defenseless against a murderous psychiatrist or mentally unstable truck driver are fantasies. And they’re not just fantasies. They’re convenient fantasies. They’re blatantly untrue and can be dispelled with the most basic research. But they reinforce your belief that carrying a gun for self-defense is pointless. They “prove” to you that being armed does no good anyway (“Look at what happened at Fort Hood! All those soldiers with guns couldn’t protect themselves!”). You’re wrong. You’re blatantly, embarrassingly wrong. If you have other, reasonable arguments against armed self-defense, fine. Use those. But stop citing the Fort Hood shootings to support your stance. Those shootings don’t prove armed self-defense is pointless. But they do expose the ridiculous stupidity of requiring otherwise-capable citizens to be helpless victims of violent criminals. I’ve been having this conversation since the 90’s when some of my non-military friends couldn’t understand why the SF troops that took down the Ft Bragg shooter did it barehanded instead of just shooting him. In the Bragg case, since it was on the PT field, chances are nobody would have been carrying anyway. But in other cases, you just have to love policies that leave even the best trained and most highly experienced soldiers helpless in the face of mass murderers. What are you going to tell us next, that all our soldiers don’t wear Kevlar and NBC protection 24/7? There’s this weird fetishization of helplessness, innocence, and victimhood among many leftists that I’ll never get on board with even though I agree with the left on a lot of specific issues. Gun control is one of these areas where the left and I do not get along. Frankly, if, as I see it, leftist politics is all about advancing the cause of the common people, then ensuring the common person has the means to defend themself should be a leftist political stance. I hereby fire you from being a leftist. It’s not nice to fire this person from being leftist 😉 You seem to think we’re all the same. Not all left-wing people are cop-hating hippies. Some (traditional) leftists are law-and-order fans who also respect the military (just ask the average Russian communist or even the average law-abiding German social democrat). I think you should revoke your decision so that Vendetta can be leftist again! You have to admit, since Vendetta is being reasonable and displaying a good understanding of human nature, he’s not being a very good leftist. “Soldiers don’t carry issued weapons and ammo everywhere on post. We didn’t get issued live small arms ammo in the first Gulf War until we were out in the desert in Saudi Arabia. I was unfortunately not surprised when I heard the same thing about soldiers guarding airports after 9/11. There is no better way to illustrate the “make a show of security” mentality than putting soldiers on guard duty without ammo. That is very good to hear. Thanks for sharing that with us. My father was in the Army from 1942-72 and even back in his day guards outside combat zones carried unloaded weapons. They had a little ditty that went “I walk my post a mile a minute and carry my rifle with nothing in it. In case of fire I ring a bell, in case of trouble I run like hell.” Considering this has been the norm on bases for so long, I don’t think it’s ignorance, I think it’s willful blindness. Thanks K. I hadn’t heard that phrase before, I’ll have to share it. Good luck, Chris. Bravely done. If you get a dozen properly trained, you can form the first Whistling Pig Chorus. It not that people that don’t get this are simply stupid, it’s that they’re so stupid they don’t even know how stupid they are, and can’t recognize that they left Ordinary Stupid 500 miles behind them in the rear view mirror, and are now alone in the middle of the Sahara Desert of Massively Stupid. While eating a bowl of Stupid. With Stupid powder sprinkled on top. As a rule, they also think chocolate milk comes from brown cows. The frustrating thing is that they’re not stupid. Many intelligent, rational people believe this. I’m guessing there is such a gap between military and civilian now, relatively few people outside the military know anything of the reality of military life. I’d guess the average LA Times editorialist has never served in the military, has no family in the military, doesn’t know anyone who was in the military, and thinks military movies made by other people just like him show what the military is really like. Frustrating doesn’t begin to describe it. It’s not just that most people don’t know anything about the military: most people know very little about anything that is not their everyday job, or a hobby they have taken up. We are a nation, by and large, of specialists, and most people know a great deal about a very narrow field, and virtually nothing outside of it. Some of us have led ….. well rounded lives …. but most people, not so much. As I noted on another blog in another context, the military is less than 1% of Americans. If you added in all the living veterans, it still probably wouldn’t crack into double digits. In 1944, 1 man in 6 between 18 and 45 was in uniform. Now, currently fewer than 1 person in 60 has even seen someone up close in a military uniform, let alone worn one themselves. We have a culture that is functionally illiterate regarding anything to do with the military. The idiot on the LATimes editorial page made a half-assed apology on their site for his boneheaded unresearched assertions, then doubled down on his original bowl of stupid, as thought the dearth of any supporting facts didn’t totally undermine his idiotic point, to wit that everyone wasn’t armed all the time, and therefore, the latest incident proves the futility of DISarming people, not of arming them. He’s not intelligent, well-read, or anything else. He just has access to a word processor with spell-checker. Which explains both the LATimes’ current circulation spiral, and why chimpanzees are a hot commodity at many newsrooms, because bananas cost less than benefits and salary. Astute comments all. 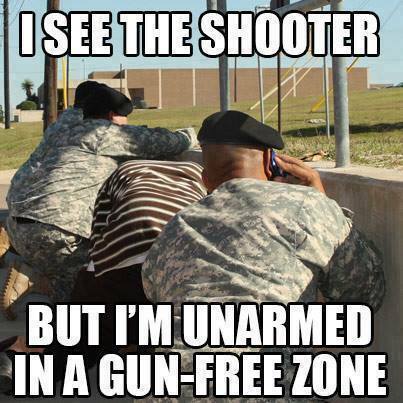 Being unarmed in any branch of the military is the norm not the exception. For anyone old enough to remember, going on R&R to Saigon meant you went unarmed even though you were probably feet (meters) from a VC. For the most part, only MP’s and the “White Mice” were armed. Is there a viable solution to the violence on bases and in society in general? Probably not, but to deny the ability to defend one’s self is probably not a good start. If I had to make a history-based guess, I’d venture that the last time/place the majority, or even a significant minority, of the members of any Army unit went about their daily duties armed would be back when the Army still manned posts along the Mexican border, roughly a century or more ago. And in 1916, Pancho Villa showed why. Quite honestly, I don’t know if I’d want to go through the standard bureaucratic .mil SOP headaches to check out an M9 every day just to make powerpoint slides at my desk at [Big 4-star HQ]. But I am absolutely in favor of a policy change to allow me to carry my M&P Shield while I’m on post. Dave, the answer to your dilemma is really simple: Don’t require the sidearms of Officers/Senior leadership NCO’s to be checked in. Make it part of the uniform. You don’t check your belt or boots in daily, do you? These people are alledgedly responsible for the health and safety of the personell under their command, yes? Give them the tools to ensure that. Never happen, though- Entire careers are based upon the rigid bureaucracy in place…. sheer inertia will not allow any change. I’m stationed out of an air force base in the gun free utopia of England. A few years ago we had a domestic violence case in on base housing that another patrol responded to, only to find the husband had taken off. The patrol went after him and somewhere along the line, they got a tip from investigations that he had a firearm. So they found him, pulled him over, and searched his vehicle, and sure enough, there was a .38 revolver in a nintendo ds case. So just to recap, we have a gun inside a gun free zone, inside a gun free country. How’s that legislation working out again? Chris, I do understand that soldiers are not carrying their guns on base and I don’t recall hearing anyone say they did. I have heard people argue that they should be allowed to do so and maybe it would have saved some innocent lives in this case. The objection that I have heard (and I also heard this in the Aurora movie theater shooting) is that when the MPs (or the police in the Aurora situation) arrive on scene, with limited information about the situation and see two or more people exchanging gunfire, how are they able to determine who the “bad guy” is? Have you had any training or experience that would allow you to make that determination quickly and accurately or do you just have to be willing to take the chance that you may end up shooting one of the people who was trying to shoot the bad guy? I cited a few instances of people who believed all soldiers are armed on base (including one personal, anecdotal instance). It was a common enough belief that someone like Piers Morgan could proclaim it on national TV, and even the extremely pro-gun guy he was debating didn’t know enough to completely shred that claim. 2) The object of an active shooter response is not to make life easier for the police. The object is to stop the killing as quickly as possible. In most AS incidents, by the time police arrive the incident is over (or the shooter kills himself as police arrive). The officers can usually spot the shooter, as he’s the guy with a gun in his hand dead from a self-inflicted gunshot to the head. Even if the officers arrive as the shooter is killing people, the shooter will likely appear and/or behave dramatically different than an armed citizen would. At the Trolley Square Mall shooting in Utah, an off duty officer did engage the shooter. Arriving police did not kill the officer, were able to recognize that he was trying to help instead of murder, and killed the shooter instead. In fact, I’m not aware of a single instance where responding police killed an armed good guy at an active shooter incident. As far as training goes, police are not taught to shoot just because someone has a gun. We know any number of armed people can be at a scene: off duty or plainclothes officers, security guards, CHL holders, etc. Wes’ re trained to look at the entire person, to evaluate their appearance and demeanor. Being armed does not automatically make someone a bad guy (although it does initially make them a potential threat). And yes, there is always a possibility a good guy might shoot another good guy. I know of 4 incidents off the top of my head in the area I work where officers were hit by friendly fire. Two of them were killed, and two of the incidents involved officers in uniform. An AS incident is a difficult, dynamic situation, people are suffering from the physiological effects of life and death stress, and mistakes are made. There’s no way to eliminate that risk. Thanks for commenting Steve, and for asking good questions. You’re welcome and thank you for answering. Very valid question and Chris answered it well. Officers from agencies all over the country deal with armed not bad guys every day. In some, like mine (state level wildlife law enforcement), everyone we interact with is armed with a long gun and many are also carrying a concealed weapon legally. Anyone who has been deployed in the past decade has spent every day outside the wire sorting out who the good guys and bad guys with guns are. Non-uniformed people with weapons, both going about their day and/or actively involved in fights are far from being automatically a bad guy – training to identify hostile intent or hostile acts is part of every day and every mission brief.